A number of metals form insoluble complexes with the bidentate ligand oxine (8-hydroxyquinoline) and can therefore be precipitated from aqueous solution on addition of this reagent. The precipitation is dependent on the pH of the solution and this aspect will be dealt with later on in this course. (1) Aluminum forms an oxine complex that can be quantitatively precipitated from aqueous solution between pH 4.2-9.8; it can thus be precipitated from an acetic acid - acetate buffer solution or from an ammoniacal solution. (2) The precipitate is crystalline, easily filtered and can be readily dried between 102 - 120°C. (3) Precipitation from an acetic acid - acetate buffer solution serves to separate aluminum from beryllium, barium, calcium, strontium, and magnesium which are often associated with aluminum. (1) Oxine is not a highly selective reagent and if aluminum is to be precipitated from an acetic acid - acetate buffer solution, all metals except the alkalis, alkaline earths and magnesium must be absent. 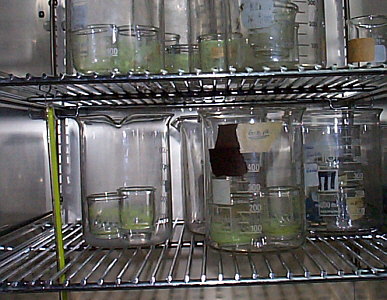 (2) The precipitate tends to retain the reagent leading to high results. However the method is sufficiently satisfactory for almost all practical purposes. Pipette 10 cm3 of the aluminum solution into a 400 cm3 beaker. Add about 150 cm3 of distilled water containing 1 cm3 of 0.1 M HCl and warm the solution to 60 - 70 oC. 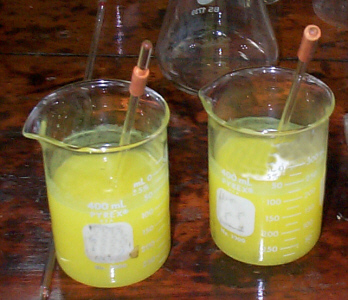 Add 20 cm3 of a 2% solution of oxine (8-hydroxyquinoline) in 2 M acetic acid, then slowly add a 2 M solution of ammonium acetate until a precipitate forms (if one is not already formed). Then add a further 25 cm3 of 2 M ammonium acetate for each 100 cm3 of solution. It should be faintly yellow at this stage, indicating that oxine is present in slight excess. Calculate the concentration (g/dm3) of aluminum in the solution. Aluminum oxinate contains 5.874% aluminum. 1.��������Draw the structure of the aluminum complex of oxine. Hint: see 1 form and another form. 2.��������What is the purpose of the ammonium acetate in the experiment? 3.��������How would you recover the oxine from the complex? 4.��������Give some industrial uses of Al compounds. 5.��������Suggest another method to determine Al. Copyright © 2002-2009 by The Department of Chemistry UWI, Jamaica, all rights reserved. Mona Campus, Kingston 7, Jamaica. Created Oct 2002. Links checked and/or last modified 19th October 2009.